You will agree that mountaineering boots are potentially the most essential bit of gear you will need to survive in the mountains. Without them, you could find yourself stranded in dangerous conditions or struggling to get to your destination. Finding good quality boots, that will get you safely and comfortably up the mountain, shouldn’t be as difficult as it usually seems. Finding the best mountaineering boots can be as simple as you want it to be when you get the right kind of help. 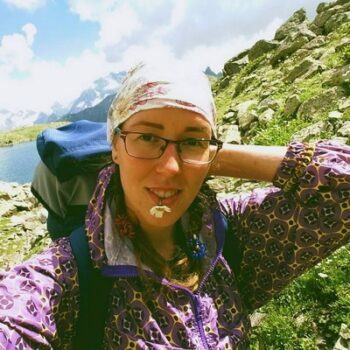 With this article you’re going to see a number of great options for mountaineering boots that will help you prepare for your next trip and feel comfortable no matter where you go. So make sure you’re checking out what we’ve found. If you are a beginner and you have no knowledge about mountaineering boots, you will need to get more familiar with styles and what to keep an eye on when looking for a perfect pair for your adventures. Here are the important things that you need to know. 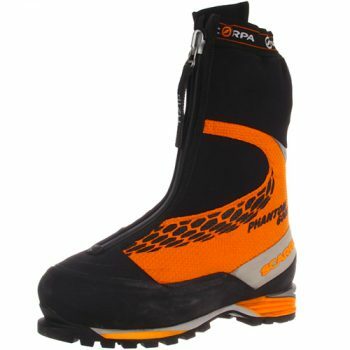 Single Boots – Which feature a solitary boot upper and are lightweight and made for hard ice climbing situations. 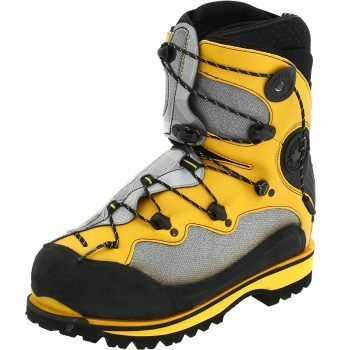 Double Boots – Which have an internal and external boot that can be separated and provide added warmth for icy areas. Super Gaiter Boots – Which has two layers that can’t be separated and have warmth, weather proofing and protection for cold and wet conditions. Most mountaineers think that if the boots are tight enough, they will add to the warmth and efficiency. Unfortunately, this isn’t true at all because you want boots that can keep you moving for an extended period. If your boots are too tight they can make it difficult to move around. What you want are boots that let your toes move and don’t restrict blood flow. That means you need to try them on with your socks and try kicking something as hard as you can. If your toes bump the end of the boot every time you kick, then you need to try a bigger size. The heel lift can be checked by trying to stand on a small edge under the toe welt of the boot. 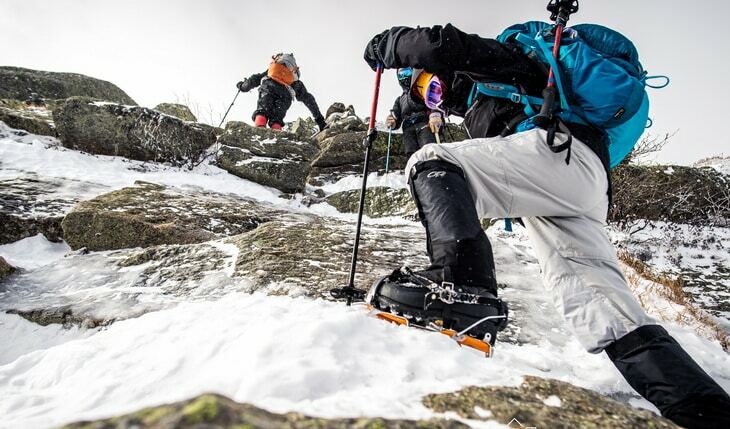 The weight of mountaineering boots is as important as the weight of your backpack. This is because the weight of the boots plays an essential part in climbing. The lighter weight has its own advantages because you won’t get tired out as easily attempting to get one foot up after another on the mountain. Sometimes you will have to sacrifice a little between weight and other features, however, so make sure that you are looking at other things. You don’t want to choose the lightest option only to find out it’s not as good on the terrain or with the weather. Rock Climbing – Boots with ankle flexibility, sole rock, thin soles and a narrow toe profile are designed for rock climbing. 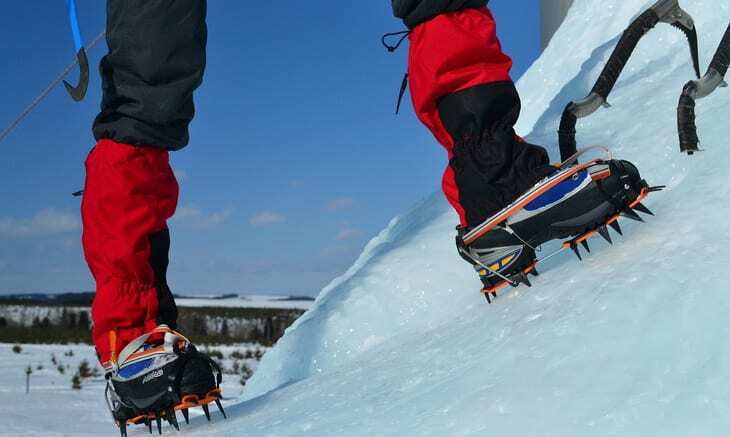 Ice Climbing – Boots that have a rigid sole will fit crampons more easily. They should also have upper support around the ankle and both front and back welts for step-in crampons. Hiking – If you have some flexibility in the sole, light weight and ankle support without restricting too much you’re going to have good boots for hiking. Warmth is a big factor for most of us in choosing the right product for outdoor use and that carries over to boots especially. What may be surprising though is that you need some air around your foot in order to keep it warm, so make sure you have shoes that fit comfortably and give a little bit of wiggle room. Some boots are going to be warmer than others because of their thickness and their materials. Make sure you’re picking some that will work for the temperatures that you’re going to be climbing or hiking in and that are going to fit well. To keep your feet warm you need to keep them dry and waterproof boots will do that for you. When you are climbing on ice waterproof boots are really important to keep the moisture out so make sure that you look at what your boots offer. You don’t want to just spray them with something later on even though that can add some waterproofing. You want boots that come with a waterproof lining and membrane to keep you dry no matter what. External sprays can lose their ability over time. If it’s built into the boot you’ll have waterproofing for a whole lot longer. If you’re going to purchase a good quality pair of mountaineering boots you’re going to spend a bit of money on them. That means you definitely don’t want a pair that are just going to fall apart on you before you’re ready to get new ones. You want something that is going to last. Make sure you look over the boots carefully to get good quality and a strong material that is designed to stand up to a lot of hard abuse. You’re going to be wearing these boots through rough terrain, so just anything definitely isn’t going to do. Choosing the right product for your next trip into the mountains means that you need to know what’s out there. Each of these boots are going to help you stay warm, dry and comfortable, no matter how long you’re planning to be gone. 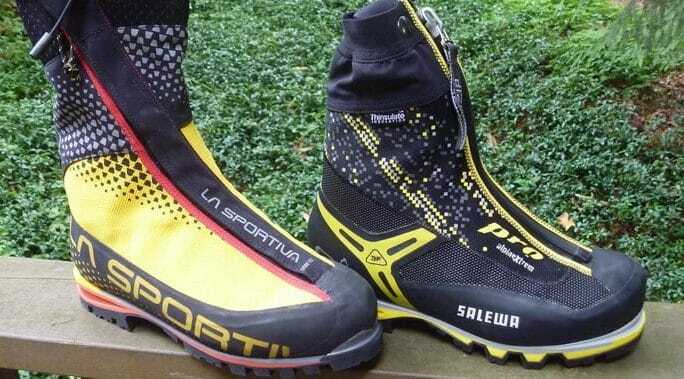 Description: These La Sportiva Batura 2.0 Boots are made of synthetic material with 2 layer Gore technology. 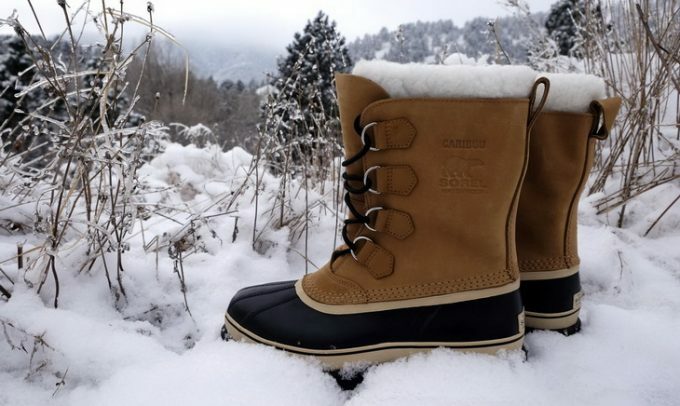 This makes these boots perfect for cold weather and comfort. The Gor Tex lining is breathable and will keep your feet dry and warm, while the midsole of these boots has air cushioning to provide flexibility and comfort while you are walking. Additionally, for excellent outer gaiter fit, these boots have an asymmetrical waterproof zipper. To provide rigidity the midsole is ultra-lightweight with honeycomb carbon and they have a super unique look that really makes them stand out when you’re hiking or mountain climbing. It also works well with the Aircushion for softness and resilience while you’re walking for an extended period of time. The boots feature an impact brake system that increases the braking power and lessens the impact force, which is a huge help in mountain climbing. They fit snugly, are warm, reliable, and comfortable no matter where you want to go hiking to or climbing to. Related: If you’re going to be out mountain climbing you need some goggles that are going to keep you protected while you go and these Julbo Sherpa Lenses are perfect for that. They have leather covers for the sides and are strong enough to protect you from glare even in the mountains. 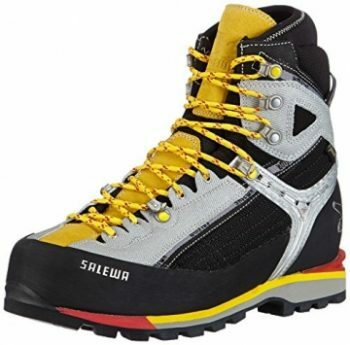 Description: The Salewa MS Pro Boots has a synthetic sole, which is adjustable and flexible d to become 100% stiff whenever you need it. The shoe has an anatomical style with its climbing toe profile, and multiple last to provide differentiated fit, which means no friction and blisters. The Vibram sole of this boot, makes it perfect for ice climbing and glacial mountaineering. The segmentation on the sole makes it more perfect as well and the fabric used is reliable, abrasion resistant, breathable, lightweight, slash and flame resistant. The 3F power is a combination of flexible ankle support as well as precision of fit which uses steel wire to help keep the heel positioned just right. With Gore-Tex insulation to improve comfort and a pro outsole, these boots are designed to keep you warm and ready to go. The moderate weight means they’re easy enough to wear on trips up the mountain and the insulation is enough for most conditions without being too heavy. Related: If you’re looking for some more casual hiking shoes you’ll definitely want to take a look at these Salewa Speed Ascent Shoes. They let you get up onto hills and some smaller mountains comfortably and easily with a less expensive shoe. 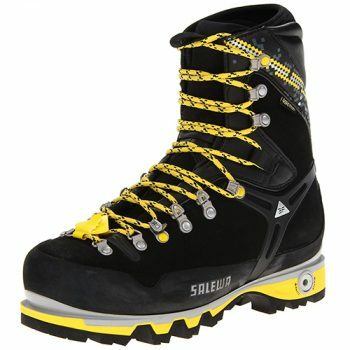 Description: The Salewa MS Raven Boot is made of polyurethane coated fabric, which is completely water resistant. To give you an excellent performance while climbing on rocky trails, this boot has a triple density micro porous rubber midsole. Crampon TPU inserts are included at the heel to ensure compatibility with most styles of crampons and multiple lasts will give differentiated fit for no rubbing and no blisters. The 3D lacing system and three automatic locking points to provide full customization in fit keep you more comfortable while you’re hiking. The boot also provides flexible ankle support, and Gore Tex lining to keep your feet warm and dry. Suitable for all seasons, these boots have flexible ankle support, and a precision fit while providing steel reinforcement through the heel. They also have a Vibram Teton outsole that provides even more support and durability for the shoe under various conditions. Though a little bit heavier, these boots are still comfortable enough to wear wherever you want to go. Related: If you’ll be out in the mountains a good helmet can be a great idea to protect you from falling debris. This Black Diamond Half Dome Helmet has a variety of color and size options and fits comfortably while keeping you plenty safe. Description: The La Sportiva Nepal Boot is made of synthetic material and features an innovative 3D flex ankle that provides lateral flexibility, while providing longitudinal lockout for exceptional support. To provide a perfect fit, it features a removable, adjustable and variable fit tongue. Made with leather, the Gore Tex lining is waterproof and breathable and keeps you dry, warm and comfortable. The EZ roller boot lacing system provides a precise fit and the shock absorbing midsole is air cushioned. It’s a cold weather boot and it’s made for climbing and hiking. The boots are designed with one piece of silicone impregnated leather for the upper, which provides more strength and durability without seams. They also come in a range of different sizes so you can get a great fit and have an ibi-thermo insole that is designed to keep the cold from the ground out of your boot no matter what it’s like outside. Related: If you’re mountain climbing you’ll want crampons with you for those steeper climbs, but you probably don’t want to just throw them in your bag. With this Black Diamond Crampon Bag you can keep your crampons safe and ready for use whenever you want them and at a low price too. 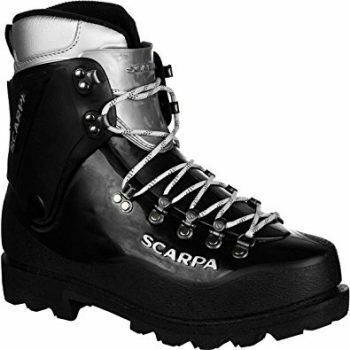 Description: The Scarpa Phantom Boots is available in all sizes and features automatic and semi-automatic crampon compatibility. It has an Ergofit system that gives you omni directional progressive flex and provides you with the perfect support for natural motion. Furthermore, these boots come with rear rand locks that hold the heel securely for mountaineering efficiently. The lace system is really easy to use, and the midsole offers maximum shock absorption. At the same time, the Vibram sole provides you strong grip and brake power. These boots are built for all conditions including very warm and cold and have a waterproof T zip and integrated gaitor, while the fitting of this boot is perfect, meaning that it will protect you from rubbing and blisters. They work well even with wet conditions, keeping you completely dry and comfortable with great ankle support and they work well for just about anywhere you might want to go hiking or mountain climbing. Related: A snow picket can help you to increase your traction and reduce your overall fatigue and this MSR Snow Picket is one you’ll definitely want to check out. It’s made with aircraft grade aluminum to provide durability and has a durable hammer-end that makes sure you don’t have to worry about damage. 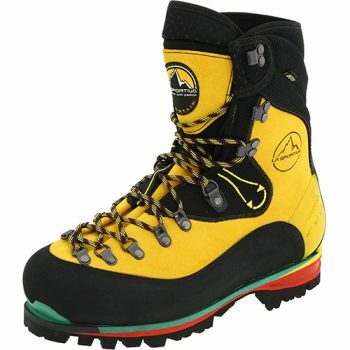 Description: The La Sportiva Spantik Boot is made of leather and features PU coated outer soles. Since these double plastic boots are made for cold weather use they have a water repellent external coating, and an insole with aluminum insulation and thermal structure carbon fiber. They definitely keep your feet warm and dry. 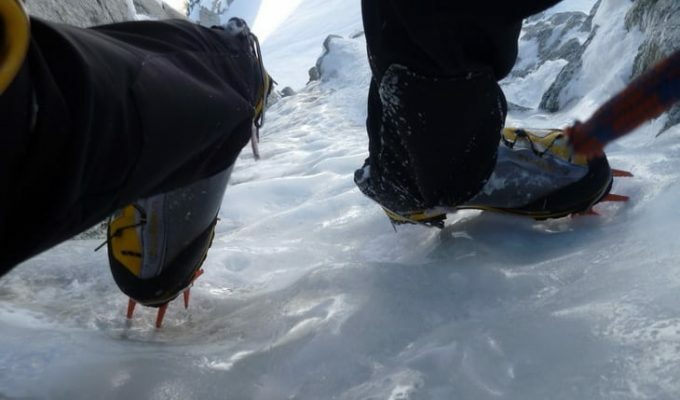 Furthermore, they also provide step-in crampon compatibility and all the features make them perfect for mountaineering. Also worth mentioning is that the technical climbing capabilities of this product, add more to their value. These boots have cellular thermal insulation and both the inner and outer boot are insulated and waterproofed to make sure you’re always going to stay comfortable and dry. They work great for 6000+ meter peaks and have a toe rocker to help you walk more naturally up the mountain without having to worry about high stepping or about hot spots and rough areas that occur with some hiking boots. Related: Gaiters can help you stay even warmer and more comfortable when you’re mountain climbing and these Outdoor Research Expedition Gaiters are definitely going to help. They come in several different colors to get the right style for you and have a low price point that’s affordable for most. Description: The Scarpa Fuego Boot is made of suede leather and features a Vibram sole to provide excellent grip and strength. It has a double tongue to give the perfect fit, one being gusseted to provide complete protection. 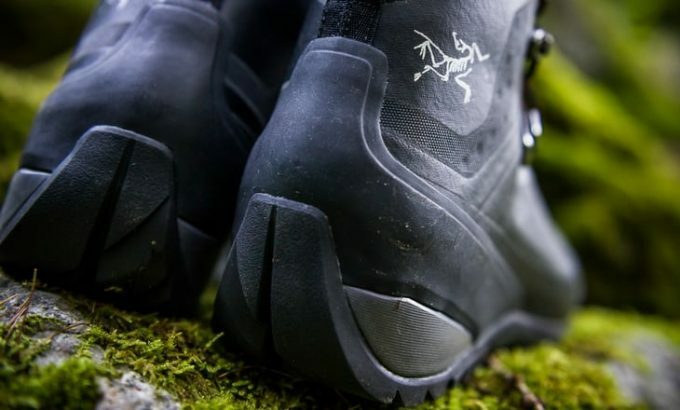 The boot is built with tall cuffs to work efficiently in the wild lands and forests, even though it is classified as a boot for mountain climbing. Specifically, these boots are perfect for firefighting if you’re not planning on wearing them on a mountain. They can be used for just about any purpose and come in just about any size you could need. These are cheaper, yet still durable and comfortable for most. However, they are stiff boots, meaning that they will work efficiently on rough terrains. Also, the fit of these boots is designed to protect you from blisters and slips as they have a close, slim fit that helps make walking a whole lot simpler for you. Related: Since these boots are made of suede leather, you will need additional waterproofing to keep your feet dry and warm. 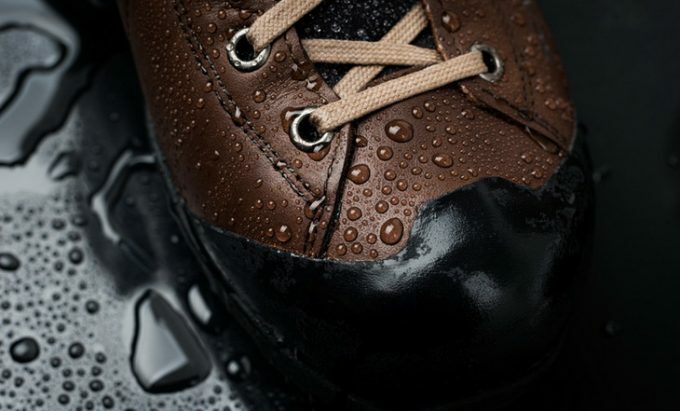 Therefore, we recommend checking out the Nikwax Nubuck & Suede Spray-On Waterproofing solution. It will give your boots the waterproof properties and you can enjoy your adventures without having to worry about the water coming through the leather. 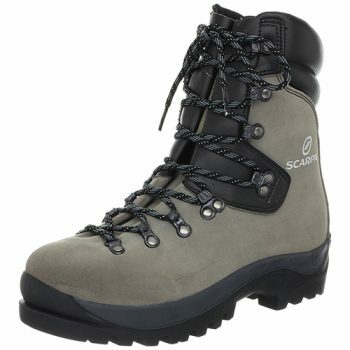 Description: These Scarpa Inverno Boots have an extremely durable and lightweight liner, are made of synthetic material, and are available in all sizes. Furthermore, the flexible pebax shell is waterproof and provides flexibility in cold environments, while the rocker sole ensures comfortable walking and climbing. The Inverno boots are designed for higher altitude, so the liner is there to keep you warm and comfortable, while the Vibram outsole provides strong grip and stability. All of the hardware is rust proof and riveted, which secures the laces and complete rubber randing improves the edging capacity and abrasion resistance. Slightly bulkier than some of the other boots available, these have a rocker sole that makes it easier to walk in them and they have a sleek and shiny appearance. They’re inexpensive and very warm while still being easy and quick to break in, no matter what you’re planning for your next hike in them. Related: These Outdoor Research Pl Base Sensor Gloves are designed to keep you warm and comfortable in most conditions. They have a tight fit, are breathable, lightweight and quick drying as well as being moisture wicking and touch screen compatible. Plus, you get grip pads on the fingers and palm for easy grabbing of whatever you need. We have reached the end of today’s article. At the end, all we can say is, whatever your plans are, you should make sure that the boots you are buying are suitable for the weather conditions and the terrain. We have given you plenty of options to choose from, and if you prioritize right, you will be able to get the right boots for your budget.All the models in our reviews are high-quality made and have great user reviews so which ever you choose, you will not make a mistake. Do you think one of these pairs of boots is the best of them all? Have you tried any of them and have feedback? Maybe you have a different pair of boots that you think should have been on this list? We want to hear all about it.